Here is an update on what has been happening in Singapore..
At the Pastor’s Summit held in Jan 9-12, where David Demian has been invited as the keynote speaker and a coach to our nation, many pastors and leaders were challenged with a call to lay it all down for Singapore’s destiny and almost everyone in the room, over 550 of us stood up in respond to the call. It was both a solemn and touching moment. 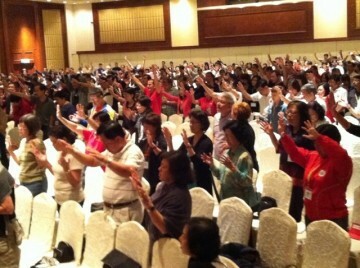 And right after the Singapore Pastors Summit, David shared with a group of Chinese pastors in Singapore on 18th Jan 2012 regarding the Chinese mandate followed by an open meeting attended by intercessors, market place leaders, the body here in Singapore where David gave a similar call and challenge for the commitment towards Singapore’s destiny where there was much tears shed and consecration made. Fast forward to March, in the recent 24th Pastors and leaders meeting in Kuala Lumpur Malaysia 12th-15th March, where Chinese speaking pastors from Singapore and Malaysia churches and ministries meet for the 24th year this year, David Demain was invited as the keynote speaker and the main theme is of this year’s meeting is entitled Entering into the Destiny of the Chinese. We believe that now is the time where God is putting in our hearts more than ever to stand on guard and in the gap for Singapore and also giving us more and more clarity and understanding regarding the mandate given to the Chinese and the awareness of His heart towards the decendents of Ishmael.. and how as Singaporeans, we need to support Malaysia in this critical season, not just being present in most of their nationwide or pre-gathering meetings, but to stand in the gap in love, support and prayers for her. We do not have the full picture or shall I say the blueprint of these significant and strategic move of God for such a time as this, but what we do have, is a desire to allow Him to lay hold of our hearts and spirits in full surrender and submission, so that we can move with Him as He takes one piece of the puzzle at a time, until the full picture is completed. So we are continuing to meet twice a month for almost two years now since after the first Homecoming in 2010, and our posture in the meetings is just to wait upon Him, discern, worship, share our hearts and update the body on what God is doing in nations like Malaysia, Hong Kong, Taiwan and our own nation in Singapore in our Singapore Family Journey meetings.. Most of the time, the contents of the meetings and prayer directives are different as we allow the Holy Spirit to have full liberty in our midst, I do notice though, in recent months, the Lord has put it in our hearts to pray for Malaysia, Asia, the Chinese mandate, our personal consecration towards Him and for our hearts and spirits to align with His. most Christians I live in them but I don’t own them, they will never see My talent in their life. I realise I was giving my life to the ministry but not to Him, I want my life to be used in a certain way. I am surrendering my life for a purpose not for a Person. There is no vision that is going to be achieved until the Lord owns it. We want to give the right of the Lord to own the Chinese. Is He a tenant or owner? If the Chinese are not going into a deep travail for the transformation of the mind we are going to miss what God has called us for. I feel this is a divine time. It is God’s choice, He has chosen you especially the Chinese in Malaysia. If you don’t align in the spirit, something you will miss and regret for the next generation. This is the hour. It is time, this is the year. A remnant from Malaysia, China, Taiwan, Singapore, Hong Kong, Macau. Now is the time for the Chinese to arise. This is not just another conference, it is the appointed time. I want to say to Chinese in Malaysia and Singapore. You have a destiny you are not here by chance, rise up to own your destiny. These days, your obedience or lack will not determine what God is about to do but it will determine your part in what God is about to do. Either you qualify yourself or disqualify yourself. When I walk in obedience I discover His plan. He is after an unshakeable kingdom, a body that will surrender to Him. The hour for Malaysia and Singapore is now, it is not next year it’s this year. You think it’s your conference, you ended up in the fullness of time. God is hovering over Asia at this hour and he is raising the Chinese. He is now moving in Malaysia, Singapore, the Lord wants the destiny of Malaysia and Singapore to be sealed. This year you will see, if you rise up, the fruit of your rising up. Praying that the Lord will lead and guide us to the fulness of what He is doing in this new season as we align our hearts with His heart and our spirits with His spirit, for Singapore, for Asia, for our destiny as Chinese, in our sphere of influence and in our personal lives. Thank-you for your covering, prayers, support, love, but mostly, your walk with us as one in our journey together with one heart, and as a family.